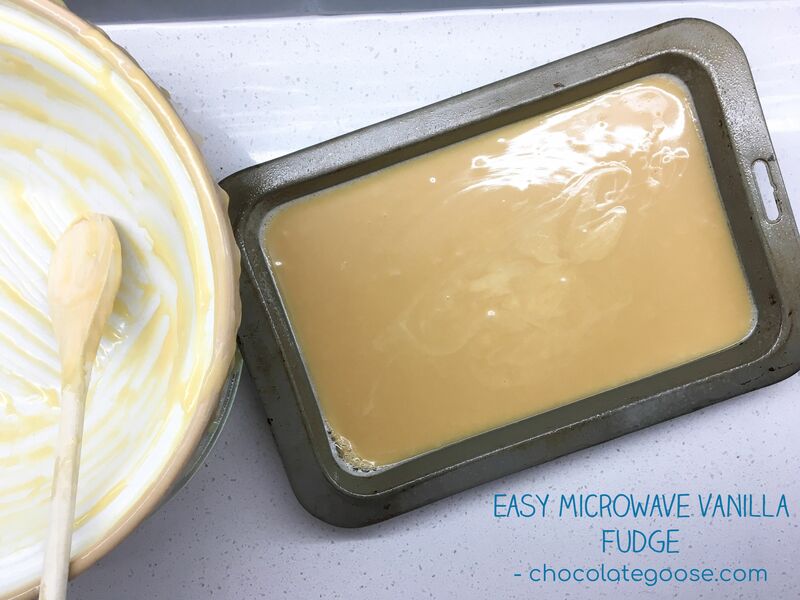 I’ve always had a love/hate relationship with fudge because when you get it right, it’s fantastic, but when you get it wrong, it still tastes good, but soft or runny fudge just doesn’t have the same appeal. And because I still haven’t splashed out and bought myself a sugar thermometer, I honestly can’t be bothered messing about with perfecting the ‘soft ball / hard ball stage’ in a glass of cold water. But recently I pulled out a very old moth-eaten material covered folder with plastic sleeves that holds specially made recipe cards filled in by myself and two sisters while we were still kids at home; and inside, I discovered a recipe titled Microwave Fudge which must be from my primary school cooking club going by my hand writing. Just seeing the recipe brought back so many memories…burnt fingers, scalded tongues, unset fudge blobbed between two Marie biscuits (similar to New Zealand’s Wine or Vanilla Wine biscuits) oozing out everywhere. The things we used to get up to as children to stave off weekend boredom or during school holidays for fun. The good old days before devices were glued to our hands, eyes and ears. Anyways, enough reminiscing. This recipe simply can’t go wrong, unless you count it possibly bubbling over in the microwave, hence the burnt fingers. You just need a really big bowl, the biggest that will fit in your microwave, and you need to watch it like a hawk. Seriously, do not move away from the microwave or it WILL boil over and make a mess. But the end result is definitely worth any possible spilled hot fudge. My little secret is that I use icing sugar instead of granulated/castor sugar. You can use castor sugar if you prefer, but I think that the icing sugar (confectioner’s sugar) has a better end result (finer texture). Prepare a small to medium size baking tray by placing baking paper along the bottom and sides. Set aside. The size tray depends on how thick you like your pieces of fudge to be: larger and thin or smaller and thick…your choice. 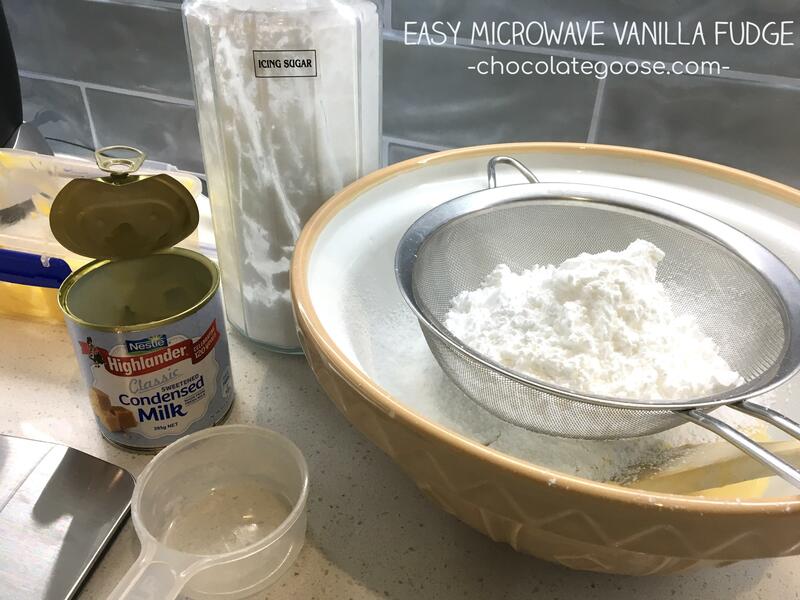 Place the butter and condensed milk into a large microwave safe glass or ceramic bowl and microwave for a few seconds to soften the butter. Sieve in the icing sugar and stir to combine. Place the bowl back into the microwave and cook on High for 3 minutes. Remove and stir. Return to the microwave and cook on High for 5 minutes, remove, add the vanilla essence/extract and stir. Please watch it at steps 4 and 5 as this is when it could boil over. If it rises too high in the bowl, stop the microwave, let it settle and then finish the time allowed. The fudge mixture should begin to caramelise and change to a darker colour. Return again and cook on High for a final 2 minutes. Remove and carefully pour the mixture into the prepared tray. Set aside to cool and set for 2 – 3 hours. Before completely set you might want to mark the grid of pieces using a sharp knife but not cutting all the way through. This helps the fudge to separate when completely cooled and settled.